The 2016 Volvo XC60 is offered with two outstanding choices in the premium utility segment to meet the needs of a wide range of customers. Those seeking the flexibility of seven-passenger seating are rewarded with the all-new three-row XC90. While those who prefer the nimble dimensions of a two-row utility vehicle can select the XC60 – one of Volvo’s top-selling models – enhanced with new alloy wheel choices and available exterior colors. Volvo’s award-winning XC60 offers a full spectrum of luxury, convenience and cutting-edge technology features while continuing its leadership of safety. The XC60 was the world’s first vehicle with standard City Safety and the first in its segment to offer Pedestrian Detection with Full Auto Brake. With the debut of Drive-E technology last year, Volvo introduced an all-new engine family, a new transmission and ECO+ fuel-saving functionality to the XC60. Volvo’s Drive-E delivers remarkably efficient operation without compromising the driving experience. The XC60 lineup begins with the remarkably efficient T5 Drive-E fitted with a 2.0-liter four-cylinder turbocharged engine with direct-injection and front-wheel drive. Volvo’s R&D engineers in Sweden employed advanced fuel-saving techniques when developing Drive-E engines including friction reduction, advanced boosting and combustion, thermal management and variable valve timing. These efforts result in 240 horsepower and 258 lbs.-ft. of torque with fuel economy estimates of 24 mpg city, 31 highway and 27 combined. The XC60 T6 Drive-E delivers even greater performance potential. This version of the 2.0-liter engine is fitted with both a turbocharger and a supercharger. The mechanically linked supercharger starts to function immediately at low revs while the turbo kicks in when airflow builds up. The combo provides linear output that offers the sensation of a larger, naturally aspirated engine yet with reduced weight and improved economy. The bottom line is 302 horsepower and 295 lb.-ft. of torque plus fuel economy estimates of 22 mpg city, 30 highway and 25 combined. Drive-E engines are teamed with a highly efficient eight-speed “Geartronic” automatic transmission. Additional gears enable the powerplants to operate at peak efficiency for excellent performance and economy. This transmission is designed to deliver smooth shifts for excellent drivability as well as reduced noise. A start/stop feature, which automatically stops the engine when the vehicle comes to a stop to save fuel, restarts when the driver releases the brake pedal. ECO+ is exclusive Drive-E fuel-saving technology that optimizes shift points, engine control and throttle response. When activated by the driver, ECO+ can improve fuel economy by five percent depending on driving style, temperature and climate. Start/Stop – The start/stop functionality is modified to allow the engine to shut down at 4mph (7kph) as the vehicle coasts to a stop. ECO-coast – Helps conserve kinetic energy by enabling the vehicle to coast. The engine “brake” is disengaged and engine speed drops to idle speed when pressure on the accelerator is released. ECO-climate – The air conditioning compressor is disconnected to reduce auxiliary loads. Pressing the AC button restarts cooling or the driver can deactivate ECO+. Volvo’s signature All-Wheel Drive with Instant Traction™ is available on a trio of XC60 models. The T5 AWD with its turbocharged 2.5-liter five-cylinder engine develops 250 horsepower and 266 lb.-ft. of torque mated to a standard six-speed “Geartronic” automatic transmission and teamed with All-Wheel Drive with Instant Traction. 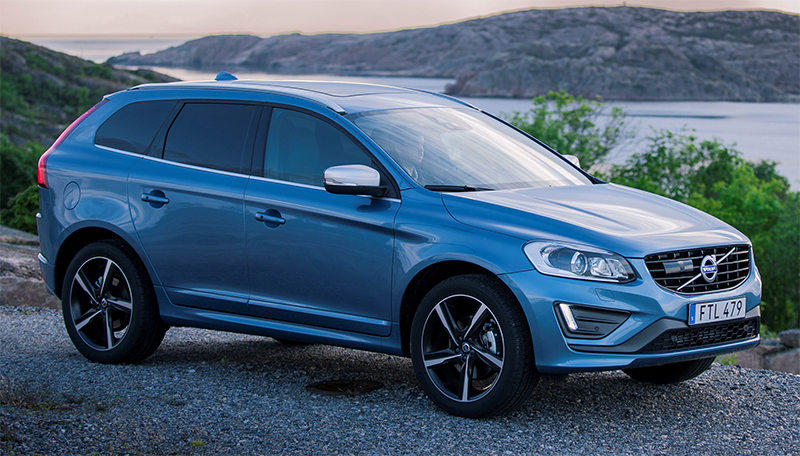 The XC60 T6 AWD results in an impressive blend of outstanding performance and value. Output for its 3.0-liter turbocharged six-cylinder engine is 300 horsepower and 325 lb.-ft. of torque. All-Wheel-Drive with Instant Traction and six-speed “Geartronic” automatic are standard. All-Wheel Drive with Instant Traction delivers the best possible grip whether the road is wet, slippery or completely dry. The advanced AWD system transfers power to the wheels with the best grip. When a tire loses traction, power is reduced to that wheel and instantly transferred to the more sure-footed wheels. The T6 AWD R-Design targets driving enthusiasts with a substantial performance upgrade. Its 3.0-liter turbocharged six-cylinder delivers 325 horsepower and 354 lb.-ft. of torque. The R-Design’s chassis employs stronger damping and a more direct steering gear that allows the driver to benefit from more alert vehicle behavior and more precise communication with the road surface. The R-Design also delivers a bolder appearance. Standard features include 20-inch “Ixion” alloy wheels, color-matched lower body moldings and a metallic-themed interior with unique aluminum inserts in the steering wheel, door moldings and the iconic center stack. It also maintains R-design attributes like silk metal finish outside mirror housings, trim moldings, skid plates, twin chrome tailpipes and the R-Design emblem displayed on the grille. 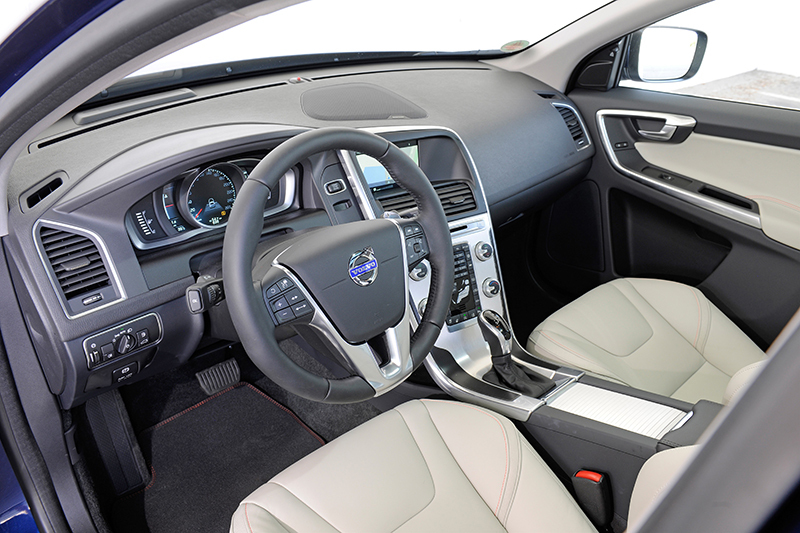 XC60 is Volvo’s first crossover to offer sporty steering wheel-mounted paddle shifters. Standard on R-Design models, these paddle shifters let the driver shift manually with both hands on the steering wheel. Advanced Quick Shift is another standard performance feature for R-Design. When Sport Mode is selected or when using paddle shifters, software mapping improves gear change speed by 20-30 percent on third to sixth gears and up to 50 percent quicker for first to second gear. Volvo refreshed the XC60 two years ago with new styling from the windshield forward. Changes included a new hood, front fenders and fascia that emphasize a wider and more confident appearance. Redesigned headlights flank a bolder grille sporting a larger Volvo Ironmark. Other enhancements included a lower front spoiler with bright trim, vertically mounted LED daytime running lights, front and rear skid plate décor and integrated exhaust pipe design. Eighteen-inch “Pan” alloy wheels are standard on T5. New 18-inch “Leda” alloys are fitted to T6 models while the top-line T6 R-Design receives 20-inch Ixion alloys. Among the XC60’s roster of luxurious cabin appointments is a standard leather-wrapped three-spoke steering wheel with aluminum inlays, Off Black dash top, wood décor trim on front door panels, cloth-covered B-pillars, metal trim around air vents, silver décor frame for the headlight module, Quartz headliner, front door sill plates and a metal threshold for the cargo area. For those seeking the ultimate in luxury, an Inscription Package is offered on the T5 and T6. This incudes exclusive Sovereign Hide soft leather seating surfaces, Anthracite Black headliner, leather covered dashboard, Linear Walnut Wood inlays, leather front console cover and Inscription door sill plates. R-Design interior features include unique split leather upholstery with embossed R-Design logo, special R-Design steering wheel, aluminum inlays, sport pedals, instrumentation and floor mats. Every XC60 receives a high-tech instrument cluster. The base T5 has an easy to read analog style cluster. An adaptive digital display employing Thin Film Transistor (TFT) technology is standard on T5 Premier and Platinum trim levels plus all T6 and R-Design models. All XC60s have Corner Traction Control (CTC) by torque vectoring. This technology made its debut on the Volvo S60 as a further refinement of Dynamic Stability and Traction Control (DSTC). This system makes it easier to smoothly maintain the desired line on winding roads and on wet surfaces. When driving into a curve, the brakes are applied to the inner driven wheel while more power is transmitted to the outer driven wheel. This enables the driver to take the curve more tightly while reducing any tendency to understeer. The driver can accelerate out of the curve while retaining confidence inspiring grip of the road. Additional safety advancements are included with the Blind Spot Information System (BLIS) Package offered on all models. This package includes BLIS, front and rear park assist, Cross Traffic Alert (CTA) and Lane Change Merge Aid (LCMA). The system is based on radar technology installed behind the rear wheels and will detect traffic from a longer distance than the previous BLIS system. A larger detection area provides the capability of informing the driver of rapidly approaching vehicles. LCMA utilizes two levels of LED lights mounted in the A-pillar. While CTA uses radar sensors in the rear bumper to monitor traffic when backing out of a parking space, warning the driver of approaching traffic via a visual alert and audio signal. The Technology Package, standard with the Platinum trim and optional on other XC60s, includes Pedestrian and Cyclist Detection with Full Auto Brake. The package also features Active High Beam that automatically switches the headlights to low beam when opposite traffic is detected, Road Sign Information (RSI) displays traffic speed signs for the driver on the instrument cluster based on the Forward Looking Camera (FLC), Adaptive Cruise Control (ACC) with Queue Assist, Collision Warning with Full Auto Brake (CWAB), Distance Alert (DA), Driver Alert Control (DAC) and Lane Departure Warning (LDW). The XC60 was the first vehicle equipped with City Safety. This standard advanced technology is a driver support system aimed at preventing or mitigating collisions occurring at speeds of 31 mph or less. It utilizes a closing velocity sensor to help determine whether a collision is likely. 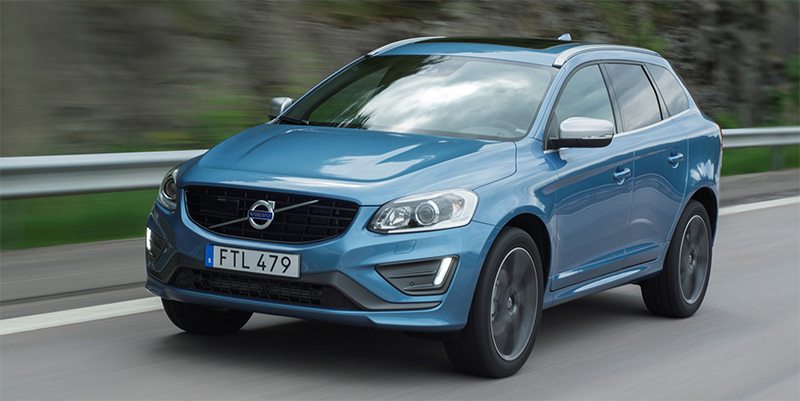 Depending on the closing speed, City Safety will either pre-charge the brakes or automatically brake the XC60 to help avoid a rear-end collision or lessen its impact. XC60’s standard Volvo Sensus system lets drivers manage information from the audio unit, navigation system (if equipped) and other functions, displaying them onto a seven-inch high-definition color monitor in the upper part of the center console. It allows the driver to explore the high-tech features of the vehicle and personalize them to suit his or her needs. Volvo On Call is a sophisticated standard telematics system that includes a driver-activated SOS button, automatic collision alert and GPS location tracking by emergency service operators. If an airbag or seatbelt pre-tensioner is deployed, emergency assistance is notified even if the driver is unable to press the button. Wi-Fi Hotspot uses the standard 3G-based Volvo On Call plus the car’s regular rooftop antenna giving the driver access to cloud-based Volvo services without an on-board smartphone. The driver can create a Wi-Fi hotspot inside the car so passengers can connect their smartphone, laptop or tablet to the Internet. Sensus Navigation, standard on Premier and Platinum trims and all T6 models, integrates all navigation functions into the car. The system is easy to use, without taking one’s attention from traffic. Unlike using a smart phone as a navigation device, the navigation screen is displayed on the standard in-dash 7-inch monitor. Sensus Navigation has improved graphics including 3D imaging, improved voice recognition, new routing options and built-in apps. The Platinum trim level includes the Harmon Kardon Premium Sound System, also available on other trims as a stand-alone option. It features innovative Dirac Live® sound tuning technology, 12 premium speakers and 650 watts. A standard high-performance audio system on base and Premier trims includes a CD player, HD Radio, AUX and USB inputs, MP3 capability, 160-watt amplifier and eight speakers. Also included is Bluetooth hands-free phone interface with audio streaming and Sirius Satellite Radio with a complimentary six-month subscription. XC60 customers seeking additional luxury and convenience features can select packages and individual options. The Convenience Package, standard on Platinum and available on all other trims, includes HomeLink, cargo cover, grocery bag holder, 12V power outlet in the cargo area, power retractable outside mirrors and power folding rear head restraints. The Proximity Package, also standard on Platinum, features Keyless Drive (standard T6), rear park assist camera and power tailgate. The available Climate Package features heated front and rear seats, heated windshield washer nozzles, heated windshield, heated steering wheel and Interior Air Quality System (IAQS). Individual options for T5 and T6 models includes contour or sport seats, dual two-stage child booster seats with power child door locks, Linear Walnut or Piano Black wood inlays, 19-inch “Lesath” diamond-cut alloy wheels, 20-inch “Titania” alloys, and dual screen rear entertainment system.